Seasonal allergies are the result of your immune system responding to airborne particles such as mold or pollen. You are more likely to develop this type of allergy in seasons when certain grasses, trees, or weeds are in flower or when mold spores are released into the air. Genetics play a role in determining who develops seasonal allergies. Yes, they can. When there are allergens in the air, such as mold or pollen, a baby's immune system can react to those allergens. The immune system takes these allergens as harmful invaders and tries to fight back, which leads to the release of histamines. This causes several symptoms to appear, such as a runny nose, sneezing, eye watering, congestion, coughing, and hives. Call your doctor immediately if these symptoms are accompanied by difficulty breathing, wheezing, or vomiting. Your baby has allergies if the symptoms persist for longer than 10 days. Examine the mucus if your baby has a runny nose. It is a cold if the mucus is thick and green. The mucus is usually clear and runny when your baby has allergies. Sneezing along with itchy, red, watery eyes usually indicates allergies. 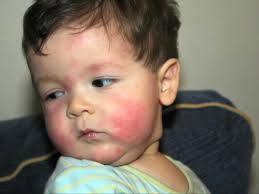 The presence of any skin irritation is usually an indicator that your baby has developed an allergic reaction. Your baby may develop dark circles under the eyes in case of allergies. Can babies have seasonal allergies? Yes, they can, and if you are confused, see your doctor for more assistance. Your doctor will ask about symptoms and conduct a physical exam to make a correct diagnosis. In some cases, your doctor may ask you to see an allergist who may order blood tests and allergy skin tests. These tests help confirm what causes an allergic reaction in your baby's case. It could be due to weed pollen, tree pollen, grass pollen and mold. It is possible to be allergic to one or more of these allergens and only an allergy test can help confirm it. They will put a drop of a purified liquid form of the allergen on your baby's skin and then prick the area with a small pricking device. Another way is to inject a small amount of allergen just under the skin to see if a lump surrounded by a reddish area appears after 15 minutes. Do not open your windows when the pollen level is high. Do the same during periods of high fungal spore levels. Keep air clean and replace air conditioner filters once a month. Immediately change your baby's clothes when he or she comes inside from outdoors. Be sure to wash it well to eliminate any outdoor allergens. Wash your baby's face, hair, and hands after he or she returns home from outdoors. It is even better to use a nonprescription saline solution to rinse his or her nose and eyes. Do not take your baby out in the morning because that is when pollen counts are on the higher side. Always keep your vehicle windows closed while traveling. When precautionary measures do not produce desired results, you may consider trying certain medications for seasonal allergies. You can try intranasal steroid sprays to prevent allergy symptoms, but these sprays take time to produce results. Therefore, it is better to use them daily from the start of an allergy season. Talk to your baby's allergist for help and he or she may prescribe antihistamines in case your baby is over 6 months old. Do not buy OTC antihistamines, or at least ask the pharmacist if it is safe for your baby's age. Can babies have seasonal allergies? Now you know the answer and you may already be thinking about ways to protect your baby from having allergies. While medications and self-care measures really help, you may also consider going for immunotherapy. It offers long-term benefits and significantly lowers your baby's risk of developing asthma in future. The procedure involves getting allergy shots once a week at the beginning, and your baby would only need it once a month after some time. This helps make your baby less sensitive to certain allergens. Be sure to discuss the risks and benefits of immunotherapy with your doctor before you decide to try it.